Former President of Catalonia Carles Puigdemont has been taken into custody in Germany. Thousands take the streets in cities and towns. Carles Puigdemont, former President of the regional government of Catalonia will appear before a judge in Germany today, after Spain issued a new European arrest warrant last week. The pro-independence leader had left Spain for Brussels in October. He had visited several countries, including Finland, a few days ago. Puigdemont is wanted in Spain for sedition and rebellion. Former Vice-President Oriol Junqueras has been imprisoned in Madrid for five months charged with similar offences. Some pro-independence groups see Puigdemont as the “legitimate” president of Catalonia. His aim was to lead what he called a “Catalan government in the exile”, with other politicians such as ERC party Marta Rovira, who fled Spain on Friday. After years of growing support for independence, the Catalan government organised an unauthorised vote on October 1. Days later, the regional parliament voted so start a “transition to become a Republic”. Spanish Prime Minister Mariano Rajoy dimsissed the government and took over the Catalan institutions with the application of Article 155 of the Spanish Constitution. Spain’s government in Madrid called a new Catalan election for December, but another pro-independence majority emerged. After some failed efforts, no coalitions to form a government have succeeded yet. In the last months, dozens of demonstrations for and against independence have caused a rise in tensions. Hundreds of thousands have rallied for opposed causes. 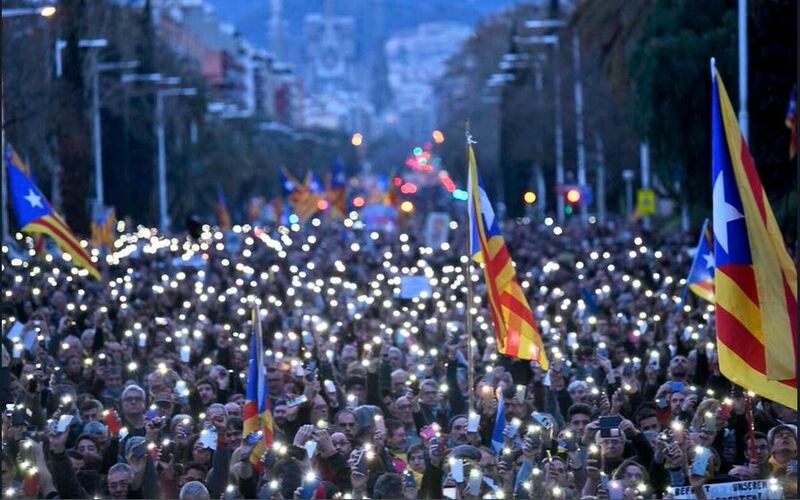 Since Friday, large demonstrations in Barcelona and other Catalan cities erupted as five top pro-independence leaders, including former President of the Catalan parliament Carme Forcadell, were jailed. Chants like “Freedom for political prisoners” and “Where are you, Europe?” were heard. On Sunday evening, hundreds clashed with the police after it as known that Carles Puigdemont had been taken into custody in Germany. About 80 were injured. Evangelical Christians have called to pray for Catalonia and Spain, and Christians in the region have been encouraged to be peacemakers in a very tense context. How do evangelical Christians see Catalonia’s future?